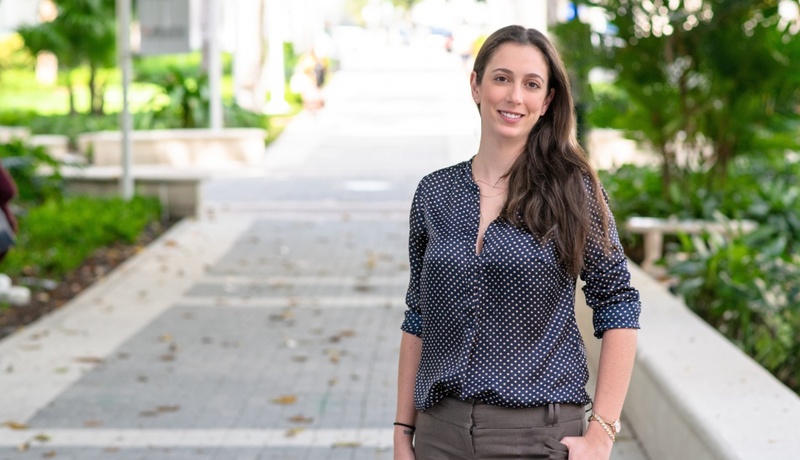 A national fellowship grant and a young investigator award at a major medical conference highlight the early achievements of a Sylvester Comprehensive Cancer Center trainee in the Sheila and David Fuente Graduate Program in Cancer Biology at the University of Miami Miller School of Medicine. Third-year Ph.D. candidate Clara Troccoli, whose research focused on treatment of advanced prostate cancer. Supervised by faculty member Priyamvada Rai, Ph.D., a Sylvester member and associate professor in the Department of Medicine’s Division of Medical Oncology, third-year Ph.D. candidate Clara Troccoli recently received a fellowship from the National Institutes of Health’s National Cancer Institute. Troccoli, an investigator in Dr. Rai’s Sylvester-affiliated cancer biology lab, is leading a research project to learn whether activation of a novel signaling pathway can be enhanced through repurposing non-cancer-related, FDA-approved drugs. The goal is to limit castration-resistant prostate cancer (CRPC), an incurable and terminal form of the malignancy. This pathway was identified in a novel cell-based screen developed in the Rai lab, which already yielded another validated CRPC target, thioredoxin-1. That previous research by Dr. Rai, Troccoli and others appeared in 2017 in Nature Communications. In addition, Troccoli won the 2018 Larry Oberley Young Investigator Award at the Society for Redox Biology and Medicine Annual Meeting in Chicago. Troccoli was awarded the highest-scored abstract/presentation in cancer biology research for her investigation of molecular drivers of androgen deprivation resistance and emergence of CRPC. In addition to focusing on her own research, Troccoli supports and encourages her peers as president of the Biomedical Graduate Student Government at UM. In this leadership role, she helps to address the academic, professional and social needs of the graduate student body by connecting her fellow early-career researchers with university administration mentors and advisors.